If you own or run a business, you know how important it is to manage the relationships you have with your business’s different stakeholder-groups (internal, external, etc. ), and to ensure that no relationships turn sour because you failed to maintain them well. So, how exactly does one manage their business relationships in a simple and effective way? The answer: CRM. 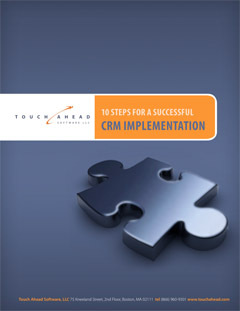 An even better answer: EquityTouch – Touch Ahead Software’s CRM solution for the alternative asset community. Why is EquityTouch the ultimate business solution for the alternative asset community, and any other business for that matter? It’s because our CRM solution software offers a multitude of features and advantages that place it ahead of the competition. Our “gems” as we like to call them. In this post, we’d like to focus on the Simple Customization feature. First and foremost, the fundamental Touch Ahead mission is to develop software that is intuitive and easy to manage for all of its users – because we realize all users approach software differently and use it for different purposes. Which is why we’ve created our CRM interface to support multiple, customizable fields that can be tailored to the preferences of any and all users – while keeping the underlying data intact and robustly searchable. Depending on what a company is using a CRM to accomplish, one company’s users will most likely need certain fields to be represented and searchable within the database different than another company’s users. These custom fields are created in order to track and monitor relationships with stakeholders. For example, maybe your organization needs to create a list of all company contacts with revenues between $100,000 and $250,000. Just create a custom “Revenue” field and select “currency” as its type. After the custom field is created and information imported, all you or your colleagues have to do to find the set of information is a simple search and export. This can be done with any data field that is created. EquityTouch also allows you to hide fields you don’t need – creating less clutter and a more usable interface. The hidden data remains completely searchable. How does this differ from other CRMs? Other CRM software limits the amount of customizable fields a user can create because most have only a certain number of applicable filters. This means that things like date, number, currency, memo and any other “you-name-it” fields aren’t possible – without expensive custom development costs. For example, one popular use of custom fields is to track deals in the pipeline. Users can create fields to load, track and update information regarding potential ventures, their industry and the stage they’re in. This data can then be exported to create reports, which can be used to monitor growth and project future deals. In addition to customizable data fields, EquityTouch offers a completely customizable interface with the ‘Drag and Drop’ feature. This allows users to create a layout that they can analyze efficiently and effectively. With priority information at the top and less important or supplementary information at the bottom (or however you or your colleagues choose to organize your fields), you’ve got a layout that works with you and helps your company move faster – giving you an edge over the competition. With a CRM like EquityTouch, the opportunities for customization are endless – and so are the opportunities for you to improve your business. To schedule an extensive tour through EquityTouch and an eventual trial of our product, please fill out this form and we’ll get back to you as soon as possible! This entry was posted in Blog and tagged alternative asset community, CRM, CRM Software, CRM solution software, CRM Solutions, EquityTouch, improve your business, manage business relationships, private equity, Private Equity CRM Solutions, track deals in the pipeline, ultimate business solution, venture capital. Bookmark the permalink.